Please pass the Cool Ranch Doritos Locos Tacos Mashed Potatoes. 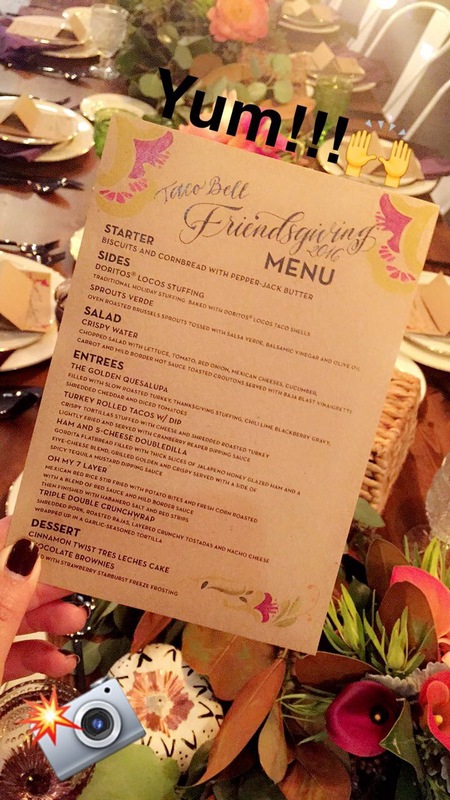 For the past five years, the Taco Bell Test Kitchen, located in the fast food chain’s Irvine, Calif. headquarters, has been hosting its own “Friendsgiving” feast in the preamble to Thanksgiving. It’s quite the glam affair: The chain invites a posh horde of 'influencers' to inhale a menu of Thanksgiving staples inspired by the chain’s menu. In other words, this annual feast is absolutely not open to the public. Depending on your read of the menu, that's either a blessing or a curse. This year's menu, which the company shared on Twitter on Friday, is a real doozy: It's a three-tiered meal with starters like butternut squash Chalupa bites and Taco Supreme croquettes. Entrees include a glazed ham slathered in Mountain Dew Baja Blast; a “Turkerito” of seasoned beef, rice, and cheddar; “Gordita bread stuffing”; and mashed potatoes made with Cool Ranch Doritos Locos Tacos. For dessert, diners were presented with either a pumpkin spiced caramel apple empanada or chocolate churros with ancho chile ganache. It's a selection that's certainly in keeping with the spirit of menus in previous years: Let us recall the Smokey Chipotle and Adobo Chalupa Shell and Tortilla Stuffing with Celery, Onions, and Garlic” (2013); “Mountain Dew Sangrita Blast Cranberry Relish” (2014); “S-Mashed Smothered Burrito” (2015) with a flour tortilla, sausage, potato bite mash, red-eye gravy, and queso fresco; and "The Golden Quesalupa," stuffed with slow-roasted turkey, stuffing, and chili-lime-blackberry gravy (2016). Yum! Zhuzh up your Thanksgiving menu with some inspiration from that cornucopia of delights. And if your cooking is a disaster, there's always the drive-thru.